Storm damage cleanup in Florida after hurricane Irma. Storm damage cleanup in Florida after hurricane Irma. This is the root mass of an elephant ear tree that was uprooted in the storm. Wellnitz Tree Care developed ArborThrive to be a comprehensive plant health care program for trees (and shrubs). The goal of the ArborThrive program is to keep your trees healthy and beautiful for years to come through preventative care and maintenance. Great landscapes add beauty and value to your property and neighborhood. Mature trees take decades to establish and are often a significant part of the landscape. When trees suffer from insects, disease, abiotic stressors, and human impact the damage can be detrimental. ArborThrive is designed to address potential problems on your property and offer proactive and reactive treatments if needed. 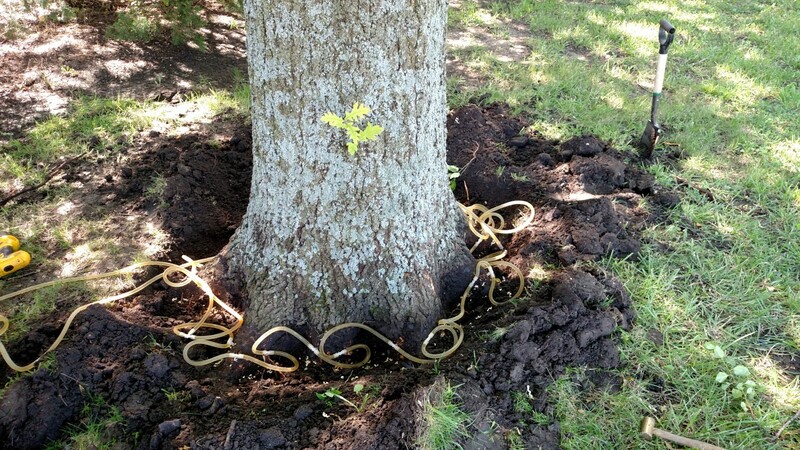 A proactive approach to managing trees is best, because a reactive approach can be too late. Trees are susceptible to secondary infections or infestations if primary stressors are not addressed. Multiple, compounding issues kill most trees rather than one single issue. Each issue should be addressed as it arises. Timely diagnosis and treatment can prevent a downward spiral ultimately resulting in death. The first step of protecting your trees is determining what trees are present on the property. 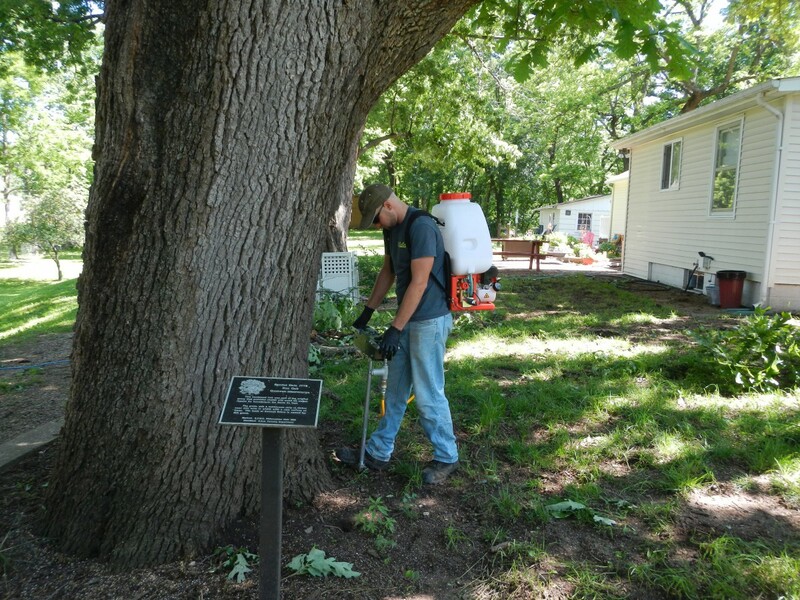 We make a list of all the trees on the property and determine the pest problems that stress your trees. 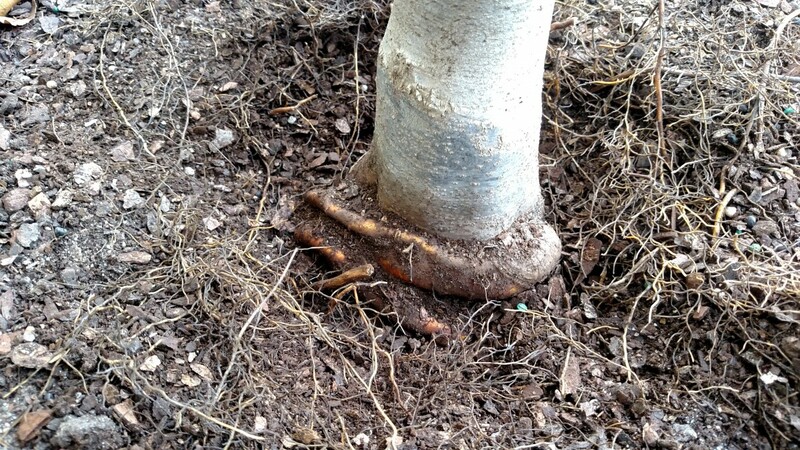 Our arborists inspect roots and plants for issues such as girdling roots and improper planting depths and make recommendations. Girdling root on a small tree. Many plant problems start with deficiencies in the soil. 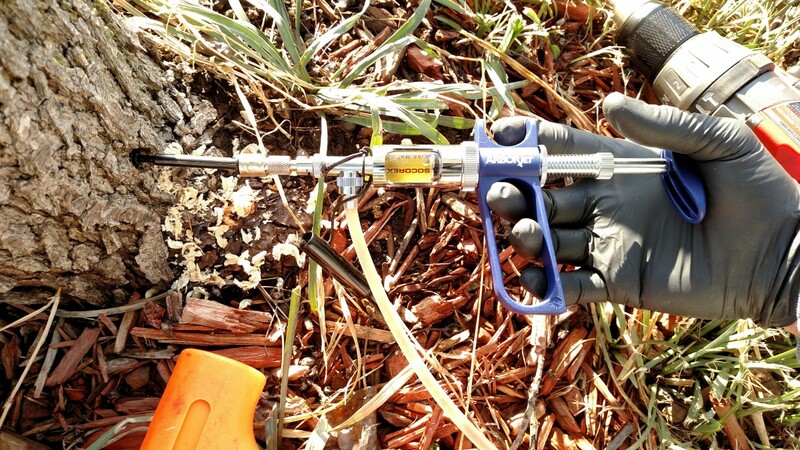 Our plant health care technicians will take soil samples to determine nutrient imbalances, soil profile, and soil structure, and then suggest corrective measures. Our plant health care technicians will identify potential pest issues and recommend preventive treatments based on the virulence of pathogens. Some tree diseases (Dutch elm, pine wilt) and insects (emerald ash borer) can disrupt flow of chemical treatments and therefore, should be prevented since damaged trees do not respond well to treatment. If the pest has affected the tree to the point of canopy die-back, the only option maybe removal. Prevention is more than chemical applications. We treat abiotic factors such as soil compaction and nutrient deficiencies for a holistic approach to plant vigor. We schedule visits at times when your tree’s pests are most likely to be active. We can catch issues early for rapid management and minimal tree impact. Preventative injection on an ornamental pear tree. We inspect your property for issues on a regular, agreed upon schedule. We provide a report with detailed findings and recommendations. If we discover a new pest we will not treat without consulting you first. With preventive treatments and a holistic approach we can reduce pesticide use with natural biological controls. We offer organic treatments for many pest issues that occur. Each program is individually tailored to fit the desires of the homeowner, as well as the needs of the landscape. We can focus on one particular tree or care for the entire landscape. Programs are set as a per visit cost or an annual fee. Our commitment to you is to design a program that meets your goals and fits your budget. Iron chlorosis treatment before and after. A majestic oak tree in an older subdivision provided shade for homeowners in the front of their house. The homeowners did some renovations to widen the driveway, making it closer to the oak. The construction crew parked their equipment under the tree and they washed out their cement truck over the root zone at the end of the day. The construction removed about 30 percent of the root zone. This tree should have been able to recover from this, but unfortunately the next two years after construction were both drought years. The tree became drought stressed from loss of roots and less water than normal. The compacted soil in the root zone left by the heavy construction equipment added to the decline. 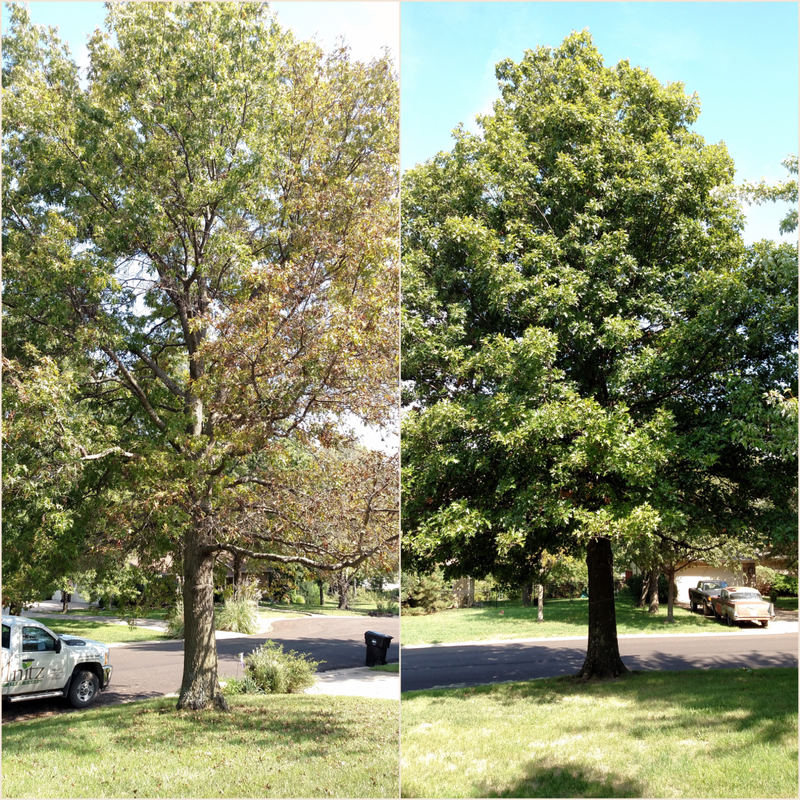 The tree started to turn yellow and the homeowner feared drought stress. They over-watered the tree. The tree was drought stressed, but the yellowing of the leaves was an underlying problem. The calcium added to the soil when the cement truck was washed out raised the pH leading to the onset of iron chlorosis. Wet and/or compacted soils can exacerbate iron chlorosis. The saturated soil caused by the homeowner created perfect conditions for root rot fungus to form. The historic oak was removed. When problems are compounded over time, trees don’t stand a chance. Iron chlorosis injection on an oak. The value of trees will vary between tree species, location, and condition. Healthy trees have positive values, but unhealthy trees can become a liability and have negative values. This is why it is important to keep you trees healthy.